1. WHAT ARE THESE CREATURES?! What happened to the legs here? Everything looks all... strange. My brother turned his head during a panoramic shot. And now his face is flat as a pancake. 4. Doesn't even need a wide angle lens. took a panoramic photo at a museum and ended up making it look like this girl has the ultimate selfie hand. WOWOWOW. Just look at the length of that selfie arm. 5. Panoramic photo gone right. This little dude managed to find his missing feet. Yay! 6. That's a long kitty. I took a panoramic picture of our living room. But my cat decided to walk through. Think I can go to the shelter and ask for whatever this breed is? 7. This one isn't so cute. 9. We still want to pet him. 10. Put that thing away. We told my buddy not to move during the panoramic shot. He didn't listen. 13. Is this a long lost Picasso? I moved while a panoramic photo was being taken, and ended up looking like a Picasso painting. 14. It's actually kind of cute. What happens when you take a panoramic photo and your dog runs into the shot. A well timed panoramic photo. 16. Where'd his body go?! My friend stood up during a panoramic shot and all that I got were his disembodied floating legs. Pro Tip: Don't take vertical panoramic pictures of your girlfriend with your iPhone. It won't be flattering. So apparently, you can unwrap your face using your phone's panoramic mode. 19. Just out for a walk. 23. They say she can pet cats from a mile away. 26. Is this cyclops a used car salesman? 27. 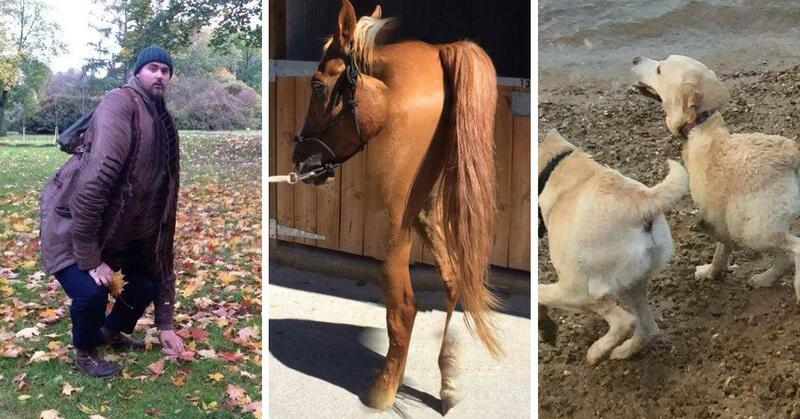 Horses are so majestic. 28. This is what happens when you skip leg day. 29. Keep your eyes on the game. 30. Two heads to pet. 31. What's even going on here? I also turned my head during a panoramic shot. 33. What happened to your face?! My friend took a panoramic, this happened to my face. 34. Stop turning your heads, people! Tried to take a panoramic picture with my dog in it. Instead I got Sloth from The Goonies enjoying a day at the river. My sister ran through my shot as I was taking a panoramic picture.